The basic lapping procedures are based on using the Rociprolap lapping machine. Start by adding 3 tablespoons of size 80 abrasive grit for a 20″ unit or 4 tablespoons for a 24″ onto the lap plate. 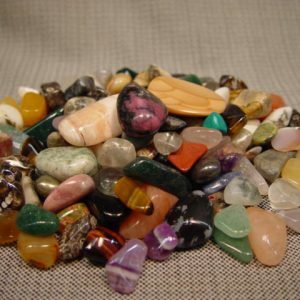 (80 grit is for hard material like agates, jaspers, etc.) Start the machine and pour in enough water to create a slurry (wet enough to levitate the grit but dry enough to minimize splashing). A simple drip system can be made so that you can leave the machine unattended for hours. (Five gallon bucket with valve and plastic tubing.) Stop the machine and add material to be lapped. A rubber ring is placed around the outer edge of the lap to prevent chipping from the bumping action. If lapping more than one piece, encircle each item with a rubber ring. (Rings: use water heater hose and a 2″ piece of a wooden dowel of the same thickness as the inside diameter of the heater hose and then use rubber cement to seal and keep the grit from getting into the ring.) Chipping creates scratches and must be prevented. 80 grit breaks down quickly so add a tablespoon of grit each hour for this operation. It is IMPORTANT that the flat you are lapping weigh 1/2 lb. per square inch in diameter. Weights may be needed. Make lead weights by melting lead shot or wheel weights. Melt the lead outdoors with plenty of fresh air and NEVER USE THE CONTAINERS ASSOCIATED WITH MELTING THE LEAD FOR ANYTHING ELSE. VERY TOXIC! For a mold form, an old stainless steel measuring cup was used, which was slightly tapered and the weight is easily removed when cooled. These can be attached using duck tape, double back carpet tape, dop wax or placed in a Plaster of Paris mold. After 3 or 4 hours wash off the bottom of the flat and draw lines in 1/2″ squares with an aluminum marking pencil. Check in 10 minutes and see if the lines are removed. When the lines are gone, the piece will be flat. Use straight grade abrasive grit for all lapping operations. Thoroughly clean rocks, laps, rings, etc. upon completion of each grit stage. One speck of grit, not removed, will scratch your rock. The next grit step will be 220 grit. Use 3 or 4 tablespoons as before with water. No need to add additional grit per hour from this lapping stage on. Lap your piece for about 4 hours. Thoughly clean everything before going to the next grit stage. Some recommend going to 400 grit but try skipping to 600 grit although the process will take longer. 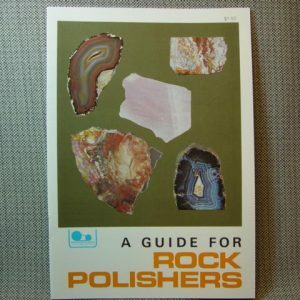 Examine your rock after four hours, but it may take up to eight hours. Should you want to leave the rocks in the lap overnight, pick up each rock and lay it on top the of ring so it won”t get stuck to the bottom. Should the piece get stuck to the plate, add water and turn on the lap. It should shake loose. If not, bump the piece with a block of wood. For polishing, use a Neoprene polishing pad or a good felt pad such as felt indoor/outdoor carpeting. Make sure the pad is a little larger (1″ or so) then the bottom of the lap or your pad will float. Sprinkle 3 or 4 tablespoons of Tin Oxide on the pad and enough water to make a slurry. Add your flats and encircle them. About 5 hours is required for polishing, but sizes and or weights will be a factor. Keep your polishing pad clean by washing thoroughly occasionally. Remember not to lap using a rusty plate or the rust will scratch your material. If the lap will not be in used for a day or so, place a thin layer of oil on the lap plate to keep it from rusting. TIP: If you are LAPPING CRYSTAL LINED GEODES, pack the center with wet soap chips to keep grit out of the centers. Thoroughly clean your flat and change the soap before each new grit step by using water from a garden hose. Jack Rose, former owner of Rociprolap says flat lap jade dry for the polishing step because it will undercut. See more tips for Lapping Slabs.